There are several different ways to make Greek pita for souvlaki, and you can find different ingredients (some use milk, some don’t, some use herbs such as thyme, some don’t), but we really like this particular method. The addition of thyme gives a very nice subtle flavour and goes with almost anything you’d use the pita for, including being used to make souvlaki, or simply as a dipping bread. Pita, sometimes referred to as “souvlaki pie,” is not difficult to make but you will want to plan ahead and give yourself some time to mix the dough ingredients and allow to rise in a warm area of your kitchen. Then, you will need some time to roll out the individual pitas into round circles before cooking them. Plan on starting your pitas at least two hours before you want to eat them! The following recipe is for six pitas, but we always double it to make twelve. They don’t go to waste; those that we did not use to make souvlaki are used later to dip into tzatziki sauce, olive oil, or anything else we might want to snack on. In a large mixing bowl, mix all the dry ingredients together (sugar, yeast, thyme, flour, salt, and ground pepper). Mix the water, milk and olive oil. The olive oil will of course, not “mix” well – but that is fine. Give it a good stir before adding the liquid to the dry ingredients in the mixing bowl. Mix the dough well and then turn onto a floured surface. Knead for ten minutes. When finished kneading, form a ball with the dough and return to a greased or thinly oiled (olive oil works great) bowl. The grease/oil coating on the inside will help to prevent the dough from sticking to the sides as it rises. 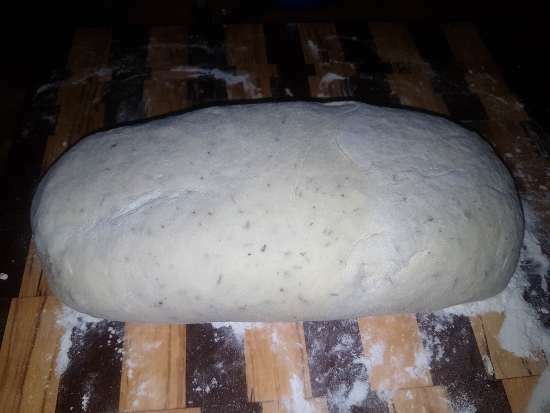 Allow the dough to rise for 60 to 90 minutes until it has doubled in size. Punch down the dough and move it to a floured surface, giving it a few stretches and folds. 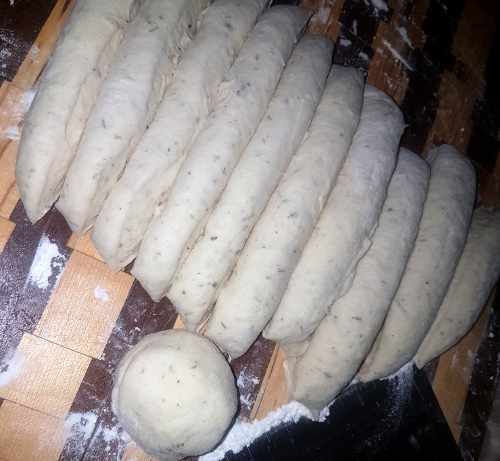 Then divide the dough into six equal portions (see photo below – we actually had doubled the ingredients to form into 12 portions) of a small ball shape. Preheat large skillet (flat cast iron works great) on medium heat. 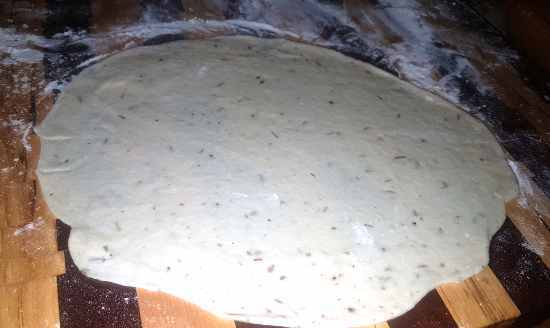 Flatten a ball of the dough, and using a rolling pin, roll out to about a 20 cm diameter. Add a very small amount of olive oil to the surface of the skillet (just enough to prevent sticking). Carefully move the flattened dough to the skillet and cook about 2-3 minutes on each side. While cooking, the dough will rise a bit, and will give the inside of the pita a nice fluffy texture. Repeat for each dough ball portion you created. 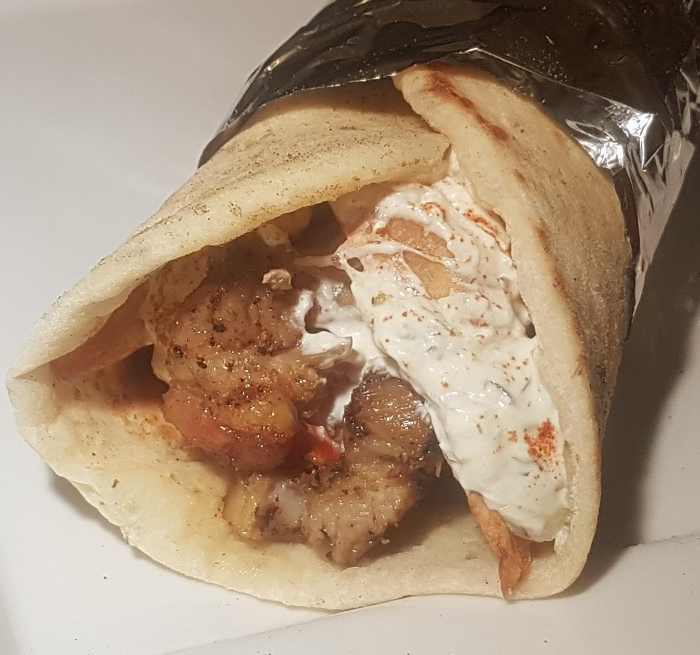 You will end up with great tasting Greek souvlaki pita that you can make your own homemade souvlaki with, or eat alone, or dipped in your favourite sauce, or enjoy with olive oil. Flour Tip:In Greece, depending on what is available, different types of flour are used to make pita, including all-purpose, corn, semolina and rye. The most common available pitas made by street vendors is all-purpose flour, which is what we have used above. When using all-purpose, a higher quality flour such as King Arthur unbleached will make a better quality pita than if using a non-premium flour. In Canada, many supermarkets have their “generic” or no-name brands, and while you can make a decent bread, you will be much happier with the results when using a premium brand.